Freestanding A-frame signs are an affordable and effective way to attract people to your business. Supremely portable, they can be taken indoors at the end of the day or quickly repositioned at any time as needed. A-frame signs can be used to advertise along the roadside, or on the sidewalk to help capture the attention of people on foot. 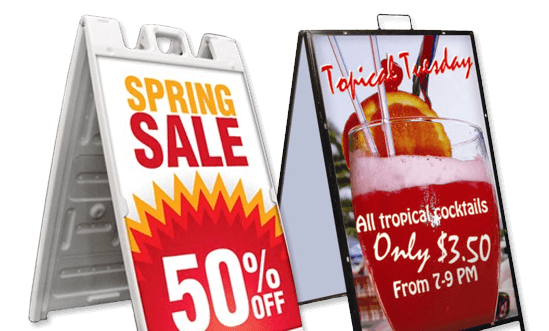 Restaurants, cafes, coffee shops, bakeries, bars, and other storefront retailers can use a-frame signs to start their advertising campaigns and announce sales offers, promote daily meal specials, and convey any message you wish to advertise. Best of all, our A-frame signs have large display areas to ensure that your message will be prominently displayed.